The F. Morton Pitt Co. has been providing uniforms and equipment to agencies and departments in Southern California since 1941. Currently located in Ventura, CA, we carry most major brands in police and firefighter uniforms, footwear, gear and accessories, as well as many other products. While we continue to supply public agencies with a complete product line, we also sell to security companies, private firms and the general public. 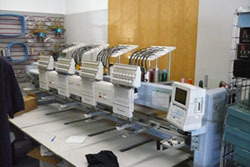 We do all of our embroidery and tailoring in house to ensure quality and expedite turnaround. Our motto is Tactical gear for everyday living and most of the products we carry are designed and manufactured for extraordinary conditions and use. Our staff has many years of hands-on experience with the products on our website, so please feel free to call customer service at 800-522-2838 with any questions. Our internet customer service hours are 10 am to 5 pm Mon. through Fri., PST. Showroom hours 9 am to 6 pm Mon through Fri., 10 am to 3 pm Sat., PST. Our email address is FMPsales@fmpuniforms.com. Our fax number is 805-650-1929.